According to news released by Nikkei on 28th January 2010, a consortium of 13 companies has agreed to develop flexible LCDs using plastic film instead of using glass substrates. The consortium members, to name a few are: Hitachi Chemical Co. , Sumitomo Chemical Co. , Kuraray Co., Sharp Corp. and JSR Corp. 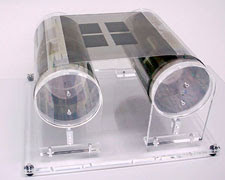 The prototype flexible ultra-thin film developed by The Technology Research Association for Advanced Display Materials was a 3.5-inch LCD having the thickness of a mere 0.49mm weighing only 7 grams. This would be another exciting breakthrough compare to the invention of LED back in 2008. This new ultra-thin flexible LCD surface will be capable of displaying clear color images via high-precision technique by combining color filters and other types of thin film. But two more years of research is needed to ensure the the display performance will not decline when the LCD is bent. 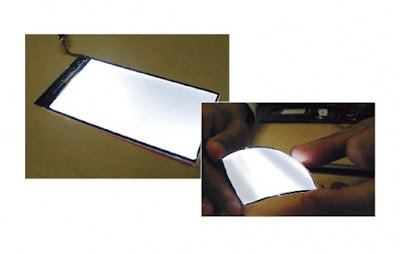 This technology will lead to commerciallization of new types of display that use curved LCDs. And for your info, the current LCDs’ panel, including those cellular phones and televisions’ panels are not bendable because they are made out of glass substrates. The way of combining several layers of plastic film for displaying colors could be a good solution on flexibility issue for present panel, hence positioning of each layer has proved to be a difficult process. This production method involves fewer processes compared with making LCD panels using glass substrates, so producers will be able to reduce equipment at their factories. Energy consumption for panel production can be slashed by about 75%, and carbon dioxide emissions can be cut by more than 70%, according to the research association. The New Energy and Industrial Technology Development Organization will also help to provide some funding for the project’s research. No info on the release date yet.